My dear friend Steph posted an item on Facebook recently that linked to a blog entry called, “Why I Left the Church…is also why I’m going back” by Misty Sutton. You can read the article, though it is an uneven, rambling affair. In summary, the author left the Mormon Church because of doubts and difficulty with all it entails: meetings, activities, requirements, behaviors, etc. 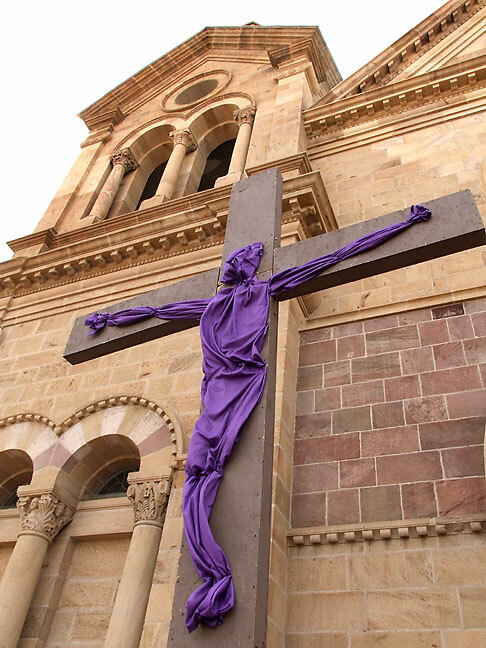 This is a lenten cross at the Cathedral Basilica of St. Francis of Assisi in Santa Fe, New Mexico. It is hard to imagine an organization more effective at keeping its members divorced from reality than the Catholic Church. The reason Steph posted the link was, “The whole time I was reading this post I kept saying, ‘she is talking about ME!’ this is exactly how I am thinking and feeling.” While I understand empathy, I have to say that the author, and Steph, are missing the real, big-picture issue because they are operating under presupposition, which assumes that everything they question and debate and struggle with operates under the umbrella of presupposing that their fundamental beliefs are correct. Put succinctly: doubts about all that goes on in the Mormon Church are a shallow reason to consider leaving. The real reason to consider leaving is that the most important thing that Church teaches is factually, demonstrably false: that there is a god. If you left because you felt you weren’t a good Christian, you should have left because Christianity itself is wrong. It’s not about whether or not you are “good enough” or “pious enough” or whether or not you can live the life the church demands. It’s not about doing anything. It’s much more simple than that: the church is founded on a lie, and nothing the Church does or says can ever change that. There. Is. No. God. The Church, and all religions, go out of their way to “overstructure” the lives of their patrons with the goal of keeping them busy with the banal minutia of religion… Sunday school, Bible verses, indoctrination, social events, politics, current events, sign-up sheets, Christmas pageants, hayrides, other religions, and on and on… to keep their minds off the real questions. Is there a god? What is its nature? What is the nature of reality? The reason they don’t want people asking these questions is pretty obvious: if they really think about it, they will conclude that their religion does not describe the truth. The slightly frightening conclusion of the blog post in question is one we see a lot in faith: “Let go.” In effect, it means that you should stop thinking and reasoning and questioning, things which are difficult and which will eventually lead you out of the Church, and let the Church think for you. Not god. The Church. If you “let go,” you are giving your will to people who want to control you, mostly for your money. The last straw in Sutton’s post, the one that labels her as silly, childish and shallow, is when she refers to Satan. It’s one thing to wonder about the true nature of the Universe and consider that there might be a creator, but it’s entirely another to believe the utterly ridiculous fairy tale about the devil. One of Sutton’s pullout quotes is, “You can’t do this, Misty. You aren’t good enough. And you never will be.” This principal is essential to the model religion uses to distract you from seeking the truth about reality. Keeping you in constant doubt about yourself confounds your ability to think rationally. If you aren’t good enough, and never will be, surely your need the church, and surely you need god. This concept borders on the obscene. It is abuse. It is slavery. So, let go. Let go of the church that wants the frightened part of you, the part that feels lost without greedier, more powerful people to tell you how to think and feel. Let go of the idea that you are incomplete without the church. And please, please stop lying to yourself that you are hearing god tell you things, when we both clearly know that it’s the church whispering in your ear. 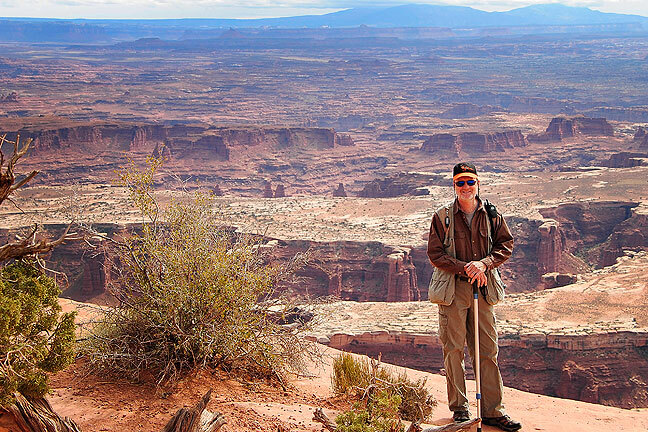 I have heard it said on more than one occasion, to children, that this (in this case, Canyonlands) was created by the “great flood” described in the Bible, despite there being ample and obvious evidence to the contrary. Is it really necessary for your religion to lie to children to get them to believe? It’s not her belief in God that’s sad (says the agnostic). It’s her belief that other people should frame what that God means to her and what she means to … er, um Him? … Her? If you’re going to believe, believe it on your own terms. It took me decades to see the presuppositions behind the “reasoning” I’d been fed in my early life, and for that slowness, I’m often ashamed.